You can make marks or shapes. You can write down some letters. You can use letters in your drawings to show sounds. You can write your name and some other words from memory. You can write down most of the letters correctly using a pencil. You can use your writing for lots of things like stories, lists and invitations. 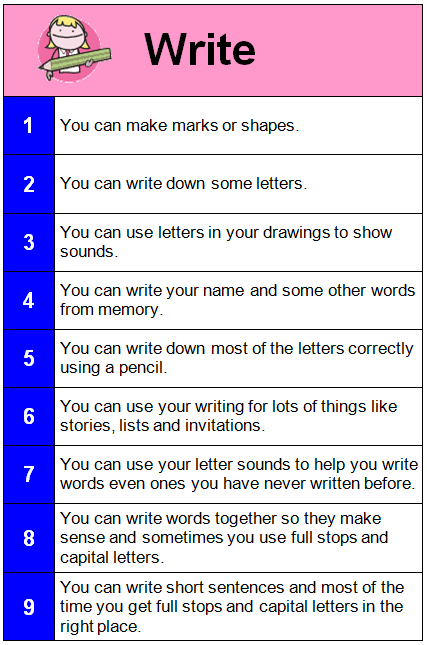 You can use your letter sounds to help you write words even ones you have never written before. You can write words together so they make sense and sometimes you use full stops and capital letters. You can write short sentences and most of the time you get full stops and capital letters in the right place.